I ran the Grover's Algorithm for 3 Qubits on the IBM Q platform (ibmqx4) and the results of the simulation and the actual computer differ a lot. The screenshots of the circuit and the results are attached. There isn't much of a difference. If you read the labels, the values are roughly the same but for some reason are presented in a different order. Any differences for a given value are due to noise and decoherence. This follows almost exclusively from noise and decoherence. In simulations, the qubits are perfect and will not decohere. Furthermore, noise has no influence on the qubits. In the actual hardware, the qubits are not perfect and hence are subject to decoherence and influences from the outside world. Therefore, measurement results might differ from what you expect. 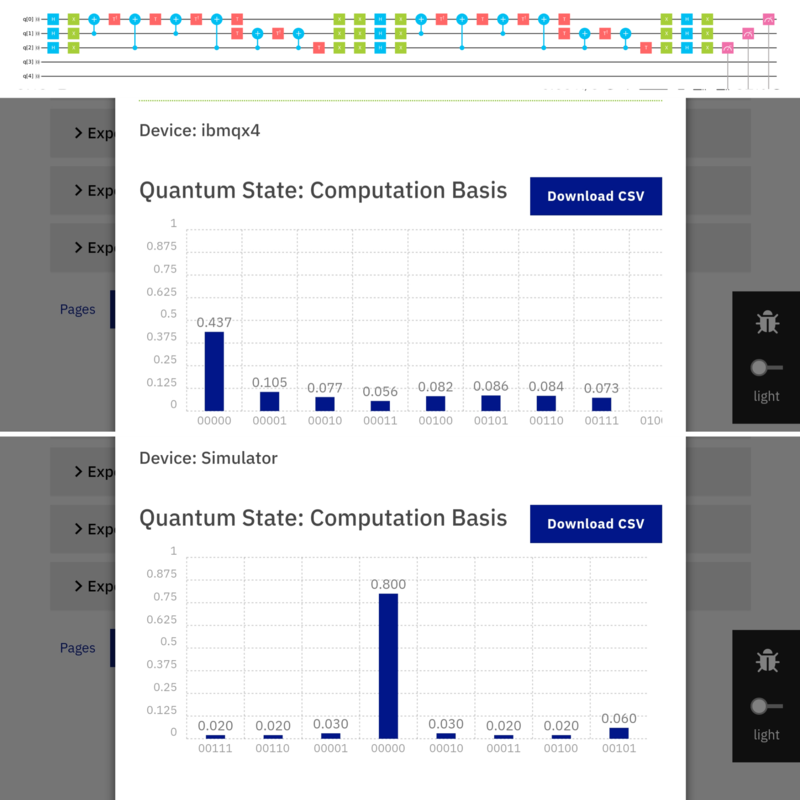 The Run command on the IBMQ interface is for the actual run on the quantum architecture. The command Simulate implements the quantum circuit on a normal classical architecture but randomizes it to make it look like the actual quantum runs. Note that this could be a perfect measurement if it were to report, but IBM uses the statistics based on its own quantum architecture and mimics those when we use the simulate command. The point of the simulate operation is just for us to know what can we expect from the actual Run of the circuit. Not the answer you're looking for? Browse other questions tagged simulation ibm-q-experience or ask your own question.